Actors from Theatre Replika. Theatre Replika/All rights reserved.Over one third of all food produced in the world goes to waste. That’s more than enough to feed the entire world’s malnourished population. So I do my recycling, but that’s still nothing compared to my grandmother, who, with a forceful look, always required me to finish everything on my plate. To her, throwing away food, especially bread, was sacrilegious. She used to make her own cheese and yoghurt when homemade Bulgarian yoghurt was common practice, before the era of the supermarket. Now, those times are gone and the plastic container has won out. My grandmother always says that the yoghurt from the supermarket doesn’t taste “quite right” but I can’t tell the difference. I ask her to explain – she cites the consistency and the taste. She can’t put it into words. We grow silent as I inspect the memory of my taste buds. Honey, from the times when you could buy it straight from Georgi, the beekeeper, and eat it with an old encrusted spoon, right out of the glass jar. The last time I saw those jars, stacked neatly in rows of six in the kitchen cupboard, was the time they were dragged outside and discarded. Within an hour they were collected from their temporary resting place near the panel block apartment building rubbish bin. My grandmother sounded the alarm with, “Did you see?! They took them, I told you they weren’t rubbish”. Stories about Bulgaria’s post-socialist rubbish, both figurative and literal, are at the heart of Theatre Replika’s documentary play We Are The Rubbish From Eastern Europe. Appearing on 12 and 13 November as the final production in the Gallery For Russian Art and Design’s series of documentary plays on migration issues in Bulgaria, Russia and the UK. The play features company members Irina, Toni, Hristiyana, Ivaylo, and others sharing their own stories and those of their friends to offer a glimpse of life as it is lived today behind the traces of the Iron Curtain. Their stories depict the existential crisis that came with a specific transition in Bulgaria. Rehearsals. Theatre Replika/All rights reserved. The trauma of the past and the uncertainty of the present have left a gaping hole in our vocal cords that cuts crucial ties both among and between generations.Our parents’ struggle to put into words what life was like under totalitarianism while we face the challenge of explaining to them, and to ourselves, what it is we are struggling against today. This lack of understanding leads to a kind of silent grief, as we all live with the consequences of a regime now long gone. While our parents were unable to flee, we sometimes feel forced to leave our country, because life here has lost value. At home, and increasingly abroad as well, we are the rubbish from Eastern Europe. The year of change was, of course, 1989. That’s the year that symbolised a societal metamorphosis, and also instituted a silent, often invisible stasis. One of the most evocative ways of working out what changed in Bulgaria, as well as in other former -totalitarian countries, is by examining the notion of rubbish. You know things have changed when you can purchase a Stalin bust on the streets of Tbilisi for $10, when just half a century ago, Stalin’s mustached, semi-profiled head was an absolute household necessity. Selling it, disowning it, drawing on it, and in any way interacting with it could have cost you an array of things, depending on the country you were in and the imagination of the secret services in power. Now, an artifact like that is superfluous. Even though it’s the same object, its power has diminished. When the Berlin Wall fell, so did the great dream of equality. With it crumbled the awesome state propaganda machine, regurgitating images of happy proletariat families in clean, minimalistic, new homes. In their place came post-socialism, poverty, and powerlessness. They say no one dared to pick through the rubbish bins under socialism. Now, numerous social groups regularly undertake this peculiar process of “recycling”; everyone is in search of different discarded objects. For those of us born in the midst of the glorious revolution, we are only semi-aware of the hushed tails and self-serving stories of what once was and wasn’t. Some of us try to collect the memories of relatives. We dust off untouched pictures, stuck in the back of the mahogany bedside chest of drawers. That chest used to be locked but these days there’s nothing to hide. For those of us born in democracy, circa 1990, came the possibility of travelling abroad, westward. We got the chance to discard that old ivory-coloured Eiffel tower thermometre and go out to see the real thing. Still, the old socialist-era fascination with “escaping” to the West and “staying there” continued to roll off the tongues of both pre- and post-1989ers, as barbed wires and dogs still lined the border with Greece. So most of us stayed, like Replika’s Hristyana, because home is where the heart is. Some left and came back, like Irina, because being in Bulgaria is fulfilling. Many of us struggled, like Ivaylo, to make a living and bring up a family in these transient times. We worry about the future, which never seems to follow any linear or logical path, but rather circles back on itself again and again. The future looks not unlike the invisible bus that Toni describes in the play, the one he waits for but can never see because the bus stop is built backwards with tin plates that block the view of oncoming traffic. Some people were forced to leave to save their own lives because, as one Replika member tells us, in Bulgaria, doctors prolong your dialysis for profit. Still others stayed because they were too old, or, heartbreakingly, far too young, to leave. These are the stories featured in the play, and the ones that make up so many people’s experience of everyday life in Bulgaria today. We are the Rubbish of Eastern Europe is more than a piece of documentary theatre, chronicling quotidian life. In their work, the actors of Theatre Replika expose those things that have become so everyday, so banal, that they are ignored to the point of seeming invisible. Theatre Replika’s production gives voice to all that’s unsaid in the post-socialist setting. All those things that create deep personal schisms, that urge one to light a cigarette by the old kitchen table in a neighbourhood (still) called “Youth” and try to decipher what one really feels. Their play is an invitation to conversation in a social context where people are so often isolated and quiet. It’s a life-jacket between generations and a mint chocolate to some bitter truths. 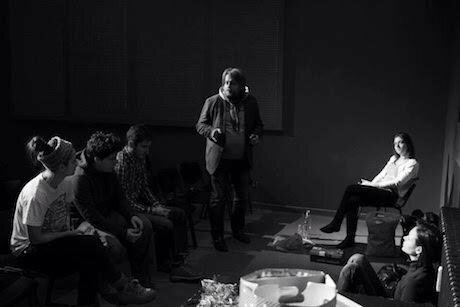 It’s no surprise that documentary theatre practice has grown exponentially in Eastern Europe in recent years. Nor is it any wonder that the socialist past continues to be one of the most potent inspirations in poetry, prose and drama across the region. In We Are the Rubbish From Eastern Europe audiences are invited to share the space with, and even to touch, the actors’ personal and impersonal objects. In this way the actors offer their audiences exclusive access to their actual lives; lives that can only be translated through the medium of theatre. This is a play that embraces difference and allows that which remains unspoken to make at least a fleeting attempt at an utterance. It represents a desire for genuine, personal connection, regardless of the barriers that persist. Theatre Replika will be performing We are the Rubbish of Eastern Europe as part of the Peripheral Visions series at London’s Gallery for Russian Art and Design (GRAD). Alongside them, the series has welcomed Moscow-based artist Talgat Batalov’s one-man show Uzbek, and the London-based Ukrainian company Molodyi Teatr (Young Theatre) with their performance Bloody East Europeans. Appearing on 12 and 13 November at the Gallery For Russian Art and Design. For more info on the series see, click here.